The Chile “Ensalada Chilena” flavor was decidedly lame. Not Chile at all. Why not a Ceviche flavor? Or something more Chilean than SALAD?? Come on. Oh, I’ve got an idea… Tear Gas flavor! 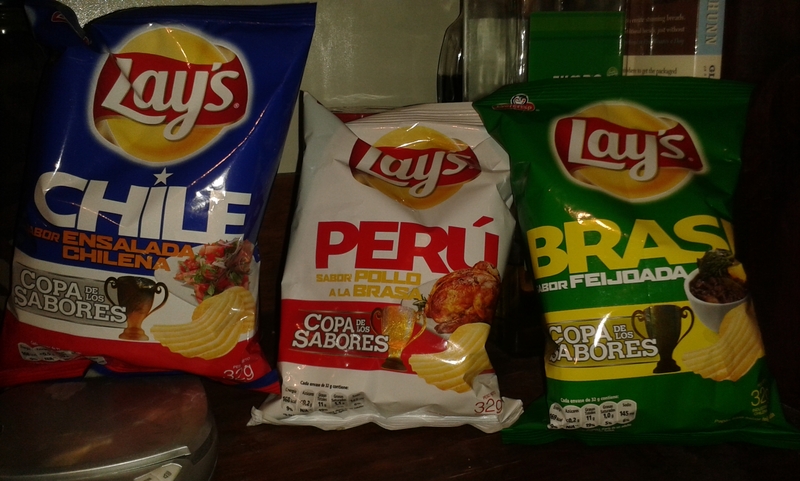 The Peru flavor tasted for sure like Polla a la Brasa, but it wasn’t that great. It reminded me of the Chicken Curry crackers I had in Indonesia. The Brasil flavor is the best of the three, but it’s not the best Feijoada I’ve had. Uruguay, naturally, has no flavor. Ha!